Does the church have a future?Across the generations troubled Christians have often asked this question.Even as early as the end of the first century the future of the church hung in the balance. False teaching, internal division and persecution were rife. Emperor Domitian had exiled the apostle John, probably in his 90s, on the island of Patmos. You can imagine John, pacing up and down the island at night, looking across the sea to the cities on the shore, wondering, `Does the church have a future? 'Into this situation the Lord comes and makes these glorious revelations. He gives John this vision and tells him to write to the seven churches of Asia Minor, in the eastern part of the Roman Empire, in what is now called Turkey.To each of these churches Jesus says, `I know... I know your hopes and dreams, your faults and failings, your joys and sorrows, your temptations and frustrations.' Jesus knew each church, and so he could speak wisely and truthfully into each circumstance. He said some hard things to shake the believers out of their apathy. He also spoke words of comfort. The letter ends by pointing the believers to heaven, a reminder that despite their present struggles, ultimately they are on the victory side.Today the church still faces internal division, opposition and persecution. It is understandable that some believers ask, `Does the church have a future? 'The answer is the same as it always has been.Absolutely. 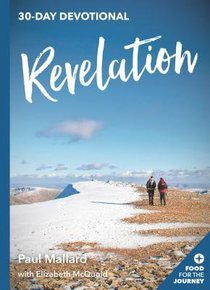 About "Revelation (Food For The Journey Series)"
Elizabeth McQuoid earned her Master of Divinity in America and is currently working in a community church in Cardiff, where she co-ordinates the women? 's ministry and is involved in Bible teaching. She lectures at Bible schools and writes for a number of Christian publications.